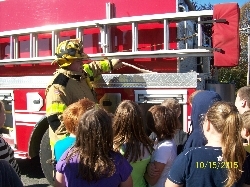 The local Washington District Fire Department paid a visit to the school during Fire Prevention Week. The firemen participated in a fire drill and then visited each classroom. Students were also treated to a tour of the fire trucks and their importance in an emergency.